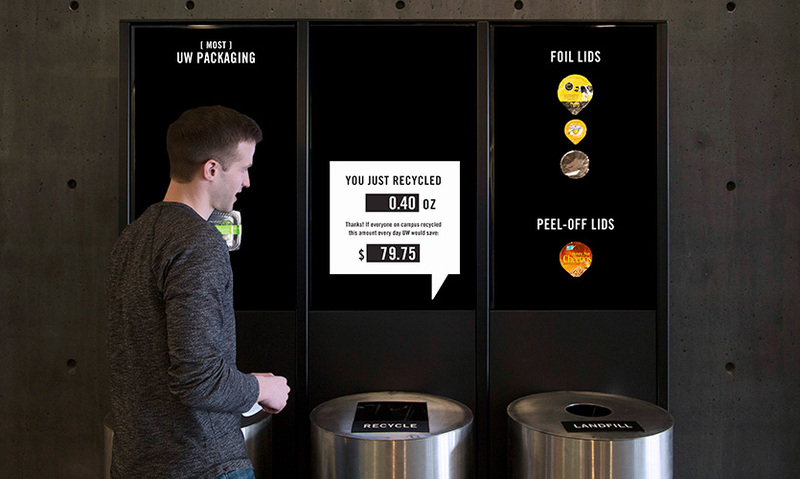 An interactive waste system with three receptacles (for compost, recycle and landfill) each of which is connected to a digital scale, microcomputer and digital screen. When not in use, the screens show a cascading series of trash items falling into the correct bins. When a user puts trash into any of the bins, it is weighed. It can be surprisingly confusing to throw something away at the University of Washington. Ideally, students sort their garbage into three categories: compost, recycle and landfill. Paper, plastic and glass get recycled, food scraps go in the compost, and everything else go to the landfill. However, many students do it incorrectly: Research shows that 75% of the trash in landfill bins is waste that could have been recycled or composted. The general concept and strategy for this project was originally conceived by a group of University of Washington Masters of Human Computer Interaction and Design graduate students in a three-week project that was part of an ideation studio taught by Karen Cheng and Linda Wagner. After the studio course ended, two design faculty members, Karen Cheng and Kristine Matthews, wrote a research grant to support the development of this initial concept into the final installation. The original MHCID graduate students observed the behavior of users at various campus trash bins. Once the grant funding was received, Wagner created a specific user research study. Student researchers intercepted and interviewed users at garbage cans to understand their attitudes, knowledge and behaviors around waste disposal. 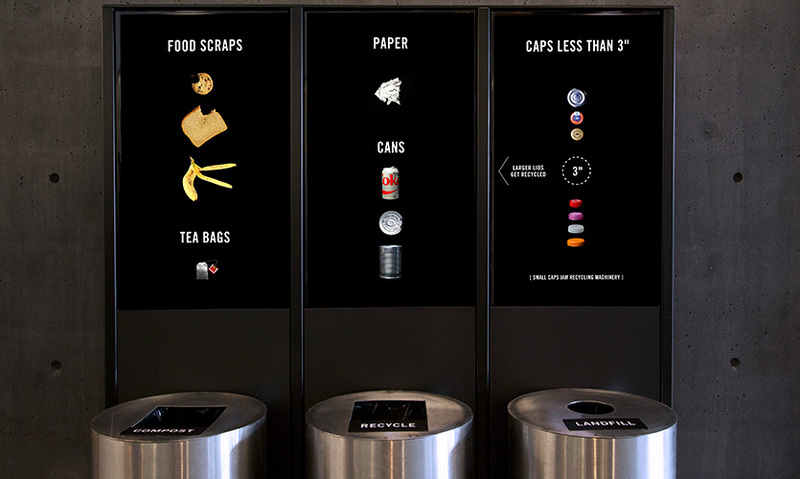 The “Smart Bins” installation educates and rewards users for correctly sorting their waste. 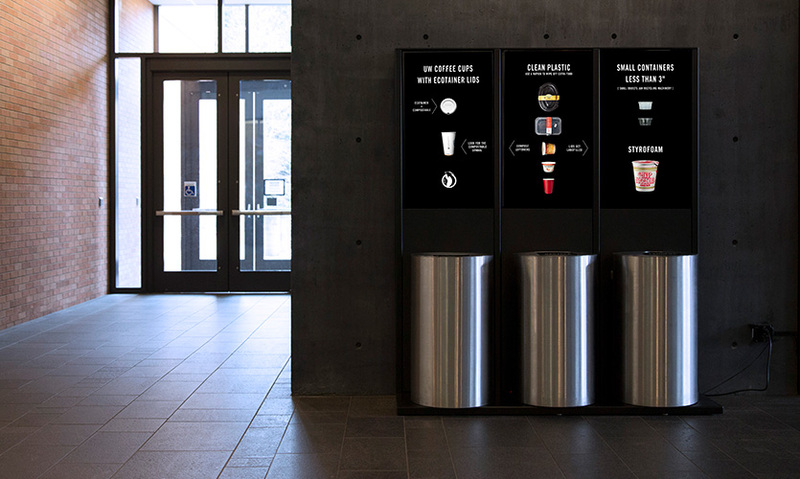 Each receptacle is fitted with a scale, microcomputer and digital screen. 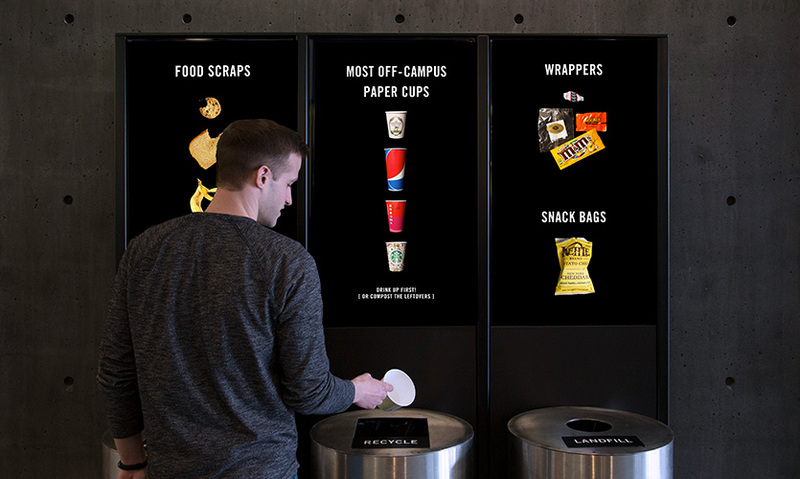 When a person puts something into a bin the screens show how much money the user just saved by proper composting and recycling, as well as the hypothetical savings campus-wide if everyone did the same. When not in use, the screens display examples of correctly sorted items cascading into each bin. There are two core features of the project. First, the bins are unique in giving users positive feedback for throwing away their waste. This was very surprising to users, because the normal trash experience is a mindless one. Second, users were very engaged by the educational video loop that plays when the bins aren't in use. The design team calls the loop "Sort Stream," because it shows a stream of correctly sorted items falling into each bin. Many users stop and watch the video for several minutes, discuss it with their friends, and take photographs of the installation with their phone. After installation, correct composting increased by 20%, and incorrect recycling decreased by 15%. The overall amount of waste correctly diverted from landfill increased 8%—a substantial environmental impact. For perspective, from 2009-13, diversion increased 1-2% annually; from 2013-15, diversion increased 3%-5% annually from the implementation of public area/restroom paper-towel composting. Beyond this direct impact, the team also believes that Smart Bins are an effective educational/outreach tool that helps users cultivate awareness of the connection between consumerism, trash and climate change. The installation leverages unique, surprising and playful design to engage users, and to get people to stop and think about the important but often overlooked topic of waste. "Smart and simple. Why is this not implemented everywhere?" "This project cleverly addresses the always challenging conundrum of knowing which bin to put your waste in in a meaningful way through the use of easy to read digital photo infographics. The added feature of informing the user how much they have saved is the highlight of this entry."